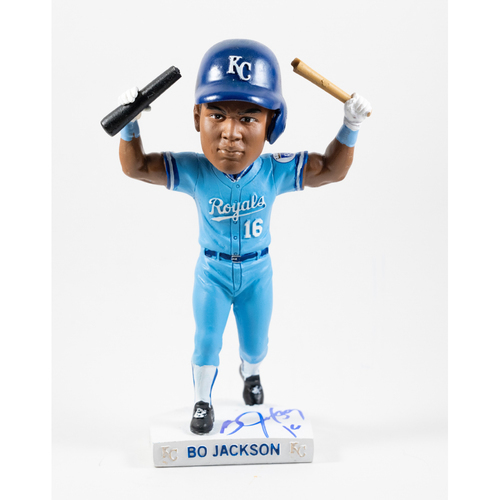 Support Royals Charities through this limited edition Bo Jackson Bobblehead to help commemorate a unique moment in Royals history. This is only the second authorized Bo Jackson Bobblehead and the first to be created by the Kansas City Royals. Bo Jackson is one of the greatest all-around athletes of all time and played for the Kansas City Royals from 1986 to 1990. Only 25 of the Bo Jackson Bat Break Bobbleheads have been signed by Bo Jackson and this auction features 10 of the autographed bobbles. All autographed bobbleheads are MLB Authenticated. Net proceeds from this auction will help support local military families and children's organizations in the Kansas City area through Royals Charities. Bobbleheads will be shipped at the end of February (please provide your current mailing address at time of purchase). The Kansas City Royals and Royals Charities are committed to being active members of the Kansas City community and region. Created in 2001, Royals Charities strives to support children, education, youth baseball/softball, and military in and around the Kansas City area. The foundation accomplishes this mission through financial donations, as well as in-kind support, including memorabilia, tickets and publicity. Under the leadership of the Glass family, Royals Charities has donated more than $10.5 million dollars in grants since its inception.